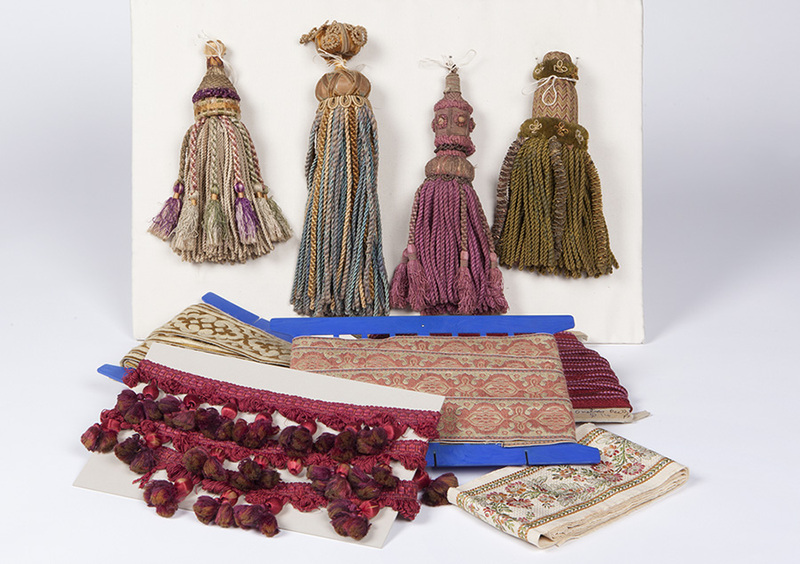 Tassels, part of the Robert Lloyd collection Caroline Simpson Library and Research Collection, Photograph (c) Jamie North, Sydney Living Museums. Tinker Tailor Interiors was founded in 1951 by Miss Del Agnew with the help of four friends, intending 'to trade as restorers of colonial homes.' 1 The company operated from Carey Cottage in Ferry Street, Hunters Hill, and later from shops in both Burwood and Pymble. Miss Agnew spent much time 'restoring and redecorating' houses such as St Malo, Hunters Hill, Truro and Cornwall in Ashfield, and Wellings. Burwood. As well as working on houses the company owned or leased, Tinker Tailor Interiors had many private clients. Robert Lloyd in the Caroline Simpson Library & Research Collection holding a curtain tie back rope and tassels, which he donated to the collection. Photograph (c) Brenton McGeachie, Sydney Living Museums. Robert brought a depth of experience to Tinker Tailor Interiors..."I knew the difference between cretonne and chintz and cottage weave and chenille"
Robert W Lloyd was born in Adelaide in 1927 and joined Tinker Tailor Interiors in 1953 having met Miss Agnew while he was working for Merle du Boulay, a well-known decorator active in Sydney at the time. After a brief stint working for interior designer Mary White in 1954, Lloyd returned to work for Miss Agnew and continued his association with her until her death in 1992. Robert modestly refers to himself as a 'jack-of-all-trades' and, although not formally trained, worked for a number of retailers, talented decorators and influential interior designers throughout his career. After making lampshades for Paul Carlyle in Rundle Street, Adelaide, he moved to Melbourne and worked briefly for Reg Riddell in Little Collins Street. Arriving in Sydney around 1947, Robert found employment in the furnishing department of McCathie's department store and later worked for Stephen Kalmar, as well as White and du Boulay. Robert brought a depth of experience to Tinker Tailor Interiors. He made bed covers, curtains, lampshades and cushion covers -' I knew the difference between cretonne and chintz and cottage weave and chenille'. 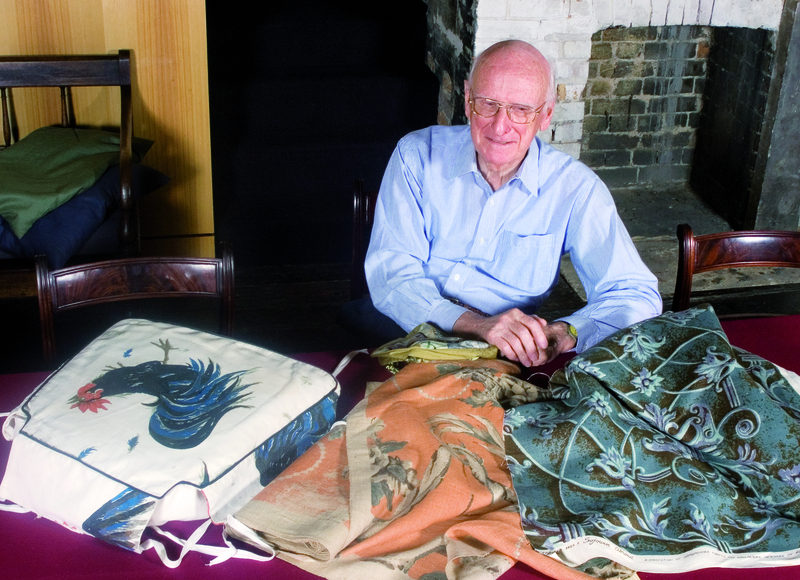 From his previous work he had learned how to block fabrics, how to determine yardages for window treatments, could advise on the wearability of fabrics, linings and headings, and had contacts with agents, manufacturers and upholsterers. Miss Agnew, with the client, would determine the furnishing schemes and advise on fabrics, wall treatments and furniture placement. According to Robert, she 'could make something lovely out of nothing' and had a 'very good eye'. One of Tinker Tailor's clients was Miriam Hamilton, a long-time Hunters Hill resident, who recalls Del Agnew as being a 'talented decorator who had an extremely good colour sense ... and while she used good quality fabrics and trimmings, she also understood how to create a strong effect using simple materials such as curtains from mosquito netting.' Mrs Hamilton had window treatments made for her dining room in 1957 and recalls blinds made from glazed chintz with a bobble fringe and a valance with a scalloped edge - similar examples have come into the HHT's research collection with this latest acquisition. View of front or entrance of St Malo, Hunters Hill NSW, c1960. (c) Mitchell Library, State Library of NSW. Photo Douglass Baglin. View of the entrance hall of St Malo, Hunters Hill NSW, 1955-61. (c) Mitchell Library, State Library of NSW. Photo Douglass Baglin. The HHT has acquired three different examples of window treatments from St Malo dated 1956-57: a set of blue silk faille and brocade curtains from the small drawing room, charcoal silk taffeta swag and tails from the main drawing room, and pair of tobacco coloured corduroy curtains and tie backs from the study. The acquisition of this collection provides an important record of Del Agnew's interpretation of historic interiors and her approach to interior decoration in Sydney from the 1950s to the 1970s. Thanks to Dr James Broadbent. Mr Kevin Fahy AM, Mrs Miriam Hamilton and Mr and Mrs Robert W Lloyd for their assistance in the preparation of this article. 3. Kevin Fahy AM, conversation with the author, December 2005. 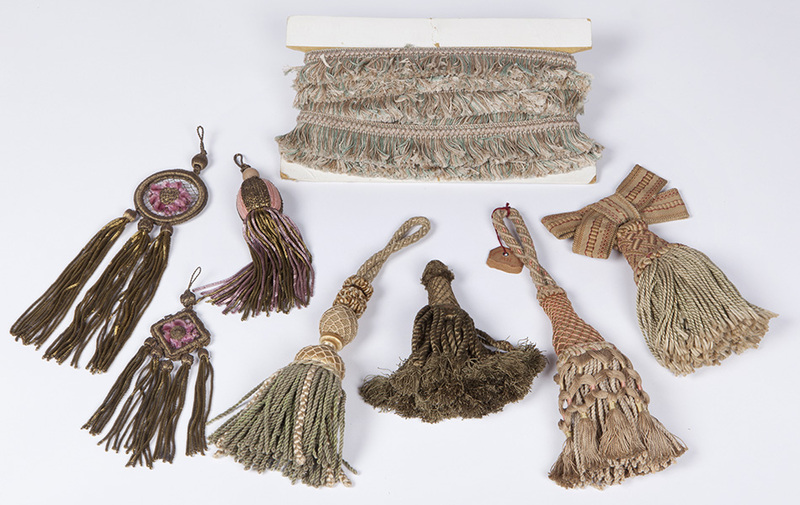 Assorted tassels, fringe and braids from the Robert Lloyd collection, 1950s-1970s. Caroline Simpson Library and Research Collection, Photograph (c) Jamie North, Sydney Living Museums. 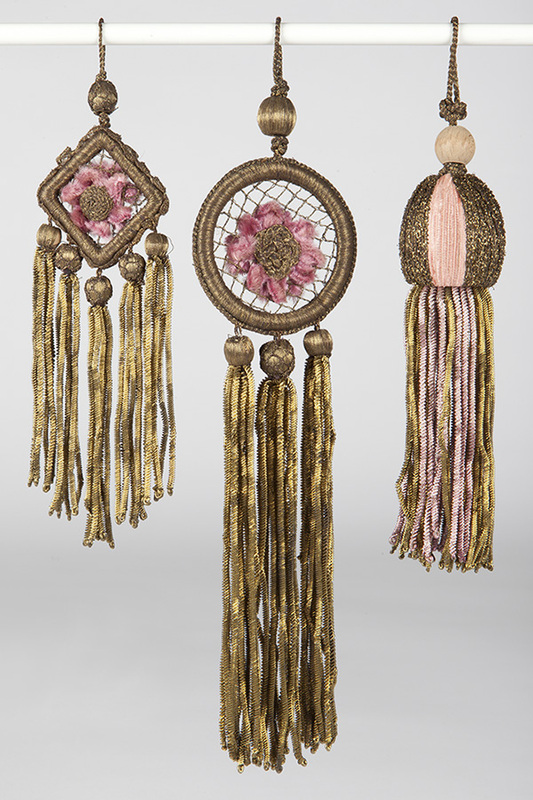 Assorted tassels and tassel fringe from the Robert Lloyd collection, 1950s-1970s. Curtain tie backs from the Robert Lloyd collection, 1950s-1970s. 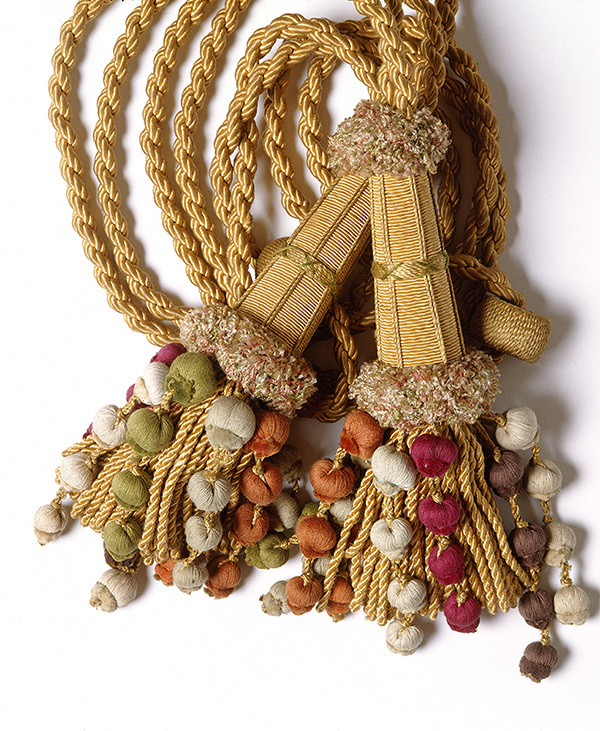 Assorted tassels from the Robert Lloyd collection, 1950s-1970s. 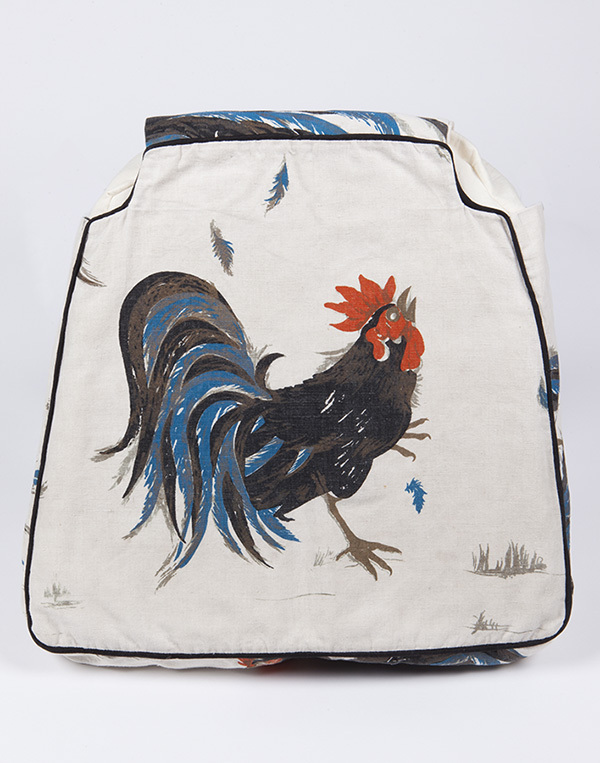 Chair cover with printed rooster motif from the Robert Lloyd collection. Caroline Simpson Library and Research Collection, Photograph (c) Jenny Carter, Historic Houses Trust of NSW .